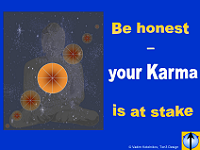 Be honest – your Karma is at stake! What's more, just being honest is not enough. You should help others be honest too! The 8 NEVERs will help you reduce lying in this World. Never listen to election campaign promises! Never read How-To-Get-Rich-Fast sales copies! Never ask your employees why they are late! Never ask project managers to write project reports! Never ask investment seekers to prepare a revenue forecast! Never ask others how you look! Never ask your kids, "Do I look stupid?" Never ask people to prepare tax reports! Never ask a consultant to diagnose your problems!